The patient was a 75-year-old black male who presented to his primary care physician with abdominal pain, poor appetite, generalized weakness, and unintentional weight loss for three weeks. The physical exam yielded mild tenderness in the LLQ and RUQ without guarding or rebound tenderness. Significant laboratory values included an elevated WBC of 13,600 cells/mL; alkaline phosphatase, 144 IU/L; and total bilirubin 2.2 mg/dL. Transabdominal ultrasound (US) identified a distended, thick-walled gallbladder, diffuse biliary tract dilatation, and a hepatic mass. 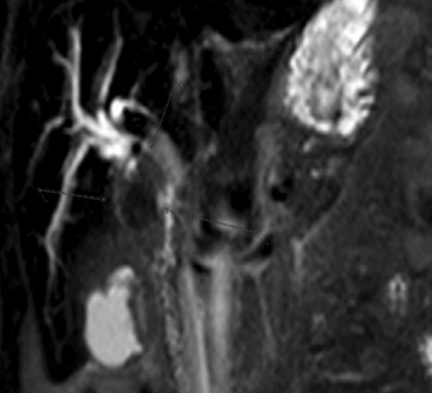 Computed tomography and MRCP confirmed these findings and identified an ill-defined intraductal mass at the confluence of the hepatic ducts. A CA 19-9 level was markedly elevated at 761 U/mL. Biopsies from the biliary and hepatic masses, and a necrotic lymph node in the porta hepatis were histologically confirmed to be cholangiocarcinoma. The patient was transferred to a tertiary care center for palliative stent placement, as he was not a surgical candidate. 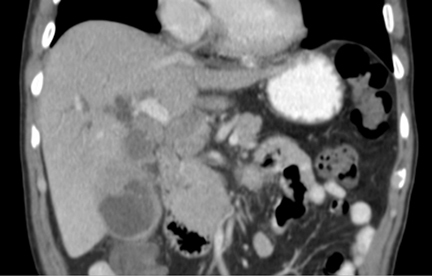 The patient presented with classic imaging findings of a perihilar cholangiocarcinoma. 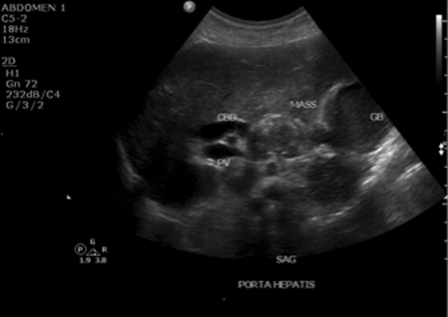 Transabdominal US showed diffuse intrahepatic biliary congestion, a small mass near the porta hepatis, and a dilated, thick-walled gall bladder (Figure 1). Recognizing a dilated or crowded biliary tree is a critical, though nonspecific, step in the workup of cholangiocarcinomas. A CT scan confirmed the presence of a hyperattenuating mass on arterial phase (Figure 2). MRCP confirmed a hypointense intraductal mass on STIR sequence, diffuse biliary congestion, and distended irregular gallbladder (Figures 3 and 4). Cholangiocarcinomas are divided into intrahepatic, extrahepatic (perihilar), and distal extrahepatic cholangiocarcinoma. The AJCC defines perihilar cholangiocarcinoma (Klatskin tumors) as occurring from the right and left hepatic ducts to the common bile duct. Intrahepatic tumors occur starting in the secondary biliary radicles and distal extrahepatic cholangiocarcinomas arise from the common bile duct forward.7, 8 The most commonly used classification system for perihilar cholangiocarcinomas specifically is the Bismuth-Corlette System. 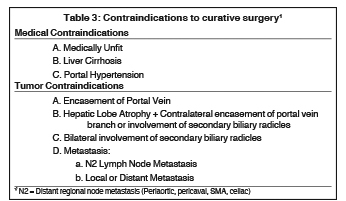 The tumor in this case was a type IV cholangiocarcinoma with multi-focal involvement extending from the confluence of the hepatic ducts to the common bile duct (Table 2). It is also important for radiologists to have a cursory knowledge of the staging system and contraindications for surgery in order to communicate effectively with ordering physicians. In this case the patient was not a surgical candidate based on local metastasis and N2 lymph node involvement (Table 3). The exact cause of cholangiocarcinoma is unknown. However, risk factors include: ulcerative colitis associated primary sclerosing cholangitis, choledochal cysts, liver flukes (Clinorchis or Opisthorcis), Thorotrast, and familial syndromes (SBLA Syndrome and HNPCC).2, 8, 9 The common theme is proinflammatory changes leading to epithelial dysplasia and carcinogenesis.10 Cholangiocarcinoma has been linked to mutations in p53, BCL-2, and KRAS. However, recent advances in genetic research suggest a more complex genetic origin. Perihilar cholangiocarcinomas are relatively rare gastrointestinal malignancies. They are most often detected after lymphatic metastasis or direct invasion of other organs. Patients with cholangiocarcinoma most often present with jaundice or other symptoms of cholestasis. However, they may present with vague constitutional symptoms. Cholangiocarcinomas are very aggressive and have poor prognoses. The most effective way to augment survival is early identification and surgical intervention. Thus, radiologists must remain vigilant for the radiologic stigmata of cholangiocarcinomas to facilitate early diagnosis and optimize patient outcomes. Darwin PE, Espat, NJ. Medscape. Cholangiocarcinoma. http://emedicine.medscape.com/article/277393-overview?pa=0GOJKRCB%2Bru0JZbaf%2FxHCZT7%2F%2Bz85vfEsZVpXSEBX6F18wgK9YdQUJpch0iMpOrMX8MwC0EECwzp432Skuf9qw%3D%3D. Updated 9 August 2016. Accessed 26 July 2016. Castaño-Llano R. Hilar Cholangiocarcinoma (Klatskin tumor). Revista Colombiana de Gastroenterologia. 2011; 26 (2): 116-124. Ballehaninna UK, Chamberlain RS. The clinical utility of serum CA 19-9 in the diagnosis, prognosis and management of pancreatic adenocarcinoma: An evidence based appraisal. Journal of Gastrointestinal Oncology. 2012;3(2):105-119. doi:10.3978/j.issn.2078-6891.2011.021. Han JK, Choi BI, Kim AY, An SK, Lee JW, Kim TK, Kim SW. Cholangiocaricinoma: pictorial essay of CT and cholangiographic findings. Radiographics. 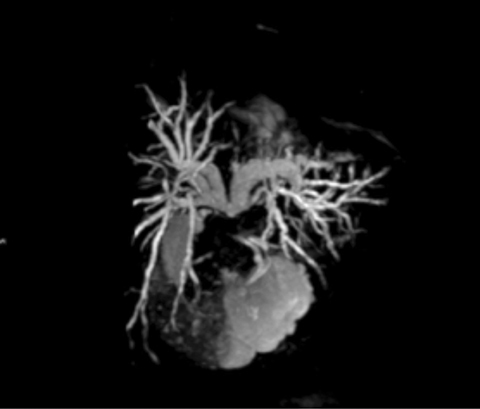 2002; 22:1. doi:10.1148/radiographics.22.1.g02ja15173. Sainani NI, Catalano OA, Holalkere NS, Zhu AX, Hahn PF, Sahani, DV. Cholangiocarcinoma: current and novel imaging techniques. Radiographics. 2008; 28:5. doi:10.1148/rg.285075183. Blechacz B, Komuta M, Roskams T, Gores GJ. Clinical diagnosis and staging of cholangiocarcinoma. Nature Reviews Gastroenterology & Hepatology. 2011; 8(9):512-522. doi:10.1038/nrgastro.2011.131. Blechacz B, Gores GJ. Cholangiocarcinoma: Advances in Pathogenesis, Diagnosis, and Treatment. Hepatology. 2008;48(1):308-321. doi:10.1002/hep.22310. DiGiacinto BJ, Bohn AM, Sanghi AK. Perihilar cholangiocarcinoma. Appl Radiol. 2018;47(6):28-31. Prepared by Mr. Di Giacinto and Ms. Bohn while fourth-year medical students at Edward Via College of Osteopathic Medicine – Carolinas Campus, Spartanburg, SC, and completing clerkships at Orangeburg Regional Medical Center, Orangeburg, SC; and Dr. Sanghi while serving as Director of MRI Studies; Department of Radiology, Orangeburg Regional Medical Center, Orangeburg, SC.